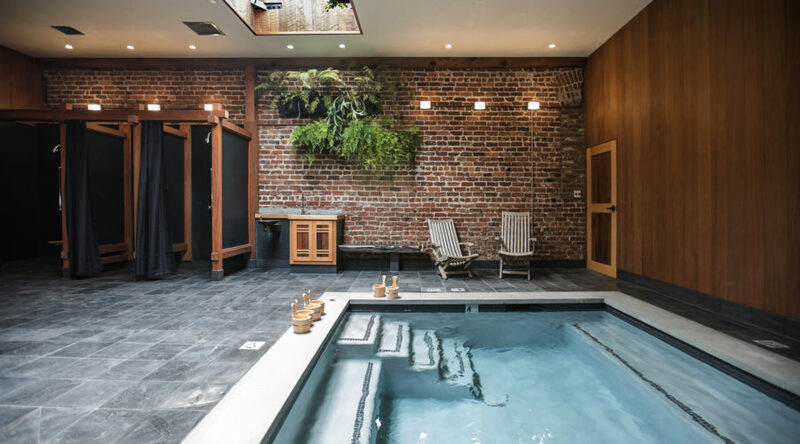 Hiding in San Francisco’s Tenderloin neighborhood, Onsen (pictured above) is an intimate Japanese bath house which also happens to have a great restaurant. Start by soaking in the communal 104-degree tub, let worries evaporate in the redwood sauna and the steam room, and then take a cold plunge before trying one of chef George Meza’s authentic dishes. Pristine and Instagram-friendly, this Korean bath house is women-only, welcoming female guests to enjoy a wet and dry sauna, hot and cold tubs, and a resting area. A Himalayan salt room and a red clay room, both carrying unique healing advantages, are also onsite. Inspired by Calistoga’s rich history of natural hot springs, this colorful spa pays homage to self-described “old-timey” rituals, offering soaking in geothermal pools, baking in mud, and getting scrubbed by an industrious attendant. Custom facials and massages complete the experience. Too blissed-out to move? Stay right here, in one of the chic rooms. Nestled between bohemian Santa Fe and the lush Hyde Memorial State Park, this spa, lodging, and restaurant combo is inspired by traditional Japanese onsens. Think private concrete baths, elaborate tubs with underwater recliners, and wet and dry saunas. A Japanese izakaya is also onsite, serving traditional and comforting nourishment. An urban oasis of wood and tile, Loyly (Finnish for “steam”) is a sauna and gathering spot in the best traditions of Scandinavia. Modest benches and nooks allow for a restful stay, but the regulars know that straightforward steaming is the main draw. Loyly has pampering perks, too: facials and treatments with woodsy ingredients like spruce and sea buckthorn. Located on the edge of Sacramento’s buzzing Midtown, Asha takes the bath house’s biggest hits and wraps them in a modern, slick package. Expect the indulgent combination of a steam room, cold plunge pool, and soaking, plus massages, yoga classes, and a relaxing lounge, all with a photogenic brick backdrop. True to the Russian banya’s unique character, this urban bath house is a welcoming facility with many nooks and crannies. The steam room is built with basalt and brick, meant to intensify the sweat, while the salt water pool promotes meditative floating. The tea lounge provides board games to get the brain moving after all the relaxation. Located in the Delano hotel, the Bathhouse provides a much needed break from the city’s temptations. Combining a cold plunge, a eucalyptus-fragrant steam room, heated whirlpools, and coconut-lime massages, the quiet, deep-hued space is straightforward relaxation. A variety of detox soaks and mud baths is available. Romantic and secluded, this small spa has a cult following. The main attraction here is soaking in healing salt water, in private tubs or a larger communal one. Then, a Finnish-style steam room will open your pores and 75-minutes massage will knead the tension away. Denver’s beloved bath house is decidedly simple design-wise, but rich in watery delights. Offerings include a eucalyptus-infused steam room, whirlpools, and a sauna, with a selection of treatments and add-ons to make a day out of a visit. Choose between massage therapy, reflexology, a foot soak, or a salt scrub, and finish by kicking back in the dining room.